The 3/8" Superline® XD winch line works best with winches ranging from 8,000 - 12,000 lbs. For more information on what length/diameter to choose please reference our Winch Line Guide. If your travels take you far off the beaten path, you need to be able to depend on your gear to perform. When it comes to winching, the Superline® XD winch line will not let you down. Made with pre-stretched and heat-treated SK75 synthetic rope with a Black Dyneema® protective jacket, the Superline® XD is the ultimate synthetic winch line, bar none. The Superline® XD stands out from the crowd due to it’s Black Dyneema® protective jacket. The downfall of any other synthetic winch line is damage from abrasion caused by particulate that gets into the fibers of the rope. During normal use, a winch line will get dirt and sand caught in the fibers. When under tension, this causes a tremendous amount of internal abrasion which degrades the line and greatly reduces its breaking strength and service life. The protective jacket on the Superline® XD completely prevents any dirt or sand from getting caught in the core fibers of the rope, which means it will maintain its breaking strength and last much longer than a conventional synthetic line. It also provides 100% UV protection since the core will never see the sun. The Superline® XD is the first synthetic winch line to utilize a new Dyneema® fiber, appropriately named Black Dyneema®. Originally, Dyneema® was only available in white and had to be coated to get any color. Unlike a coating, the black in Black Dyneema® is integral to the fiber, so it can’t wear off. At it’s core, the Superline® XD is made with the same pre-stretched and heat-treated construction as its sibling the Superline®, giving it an extremely high breaking strength. Combine that with only the highest quality hardware and high heat resistant Vectran drum protection, and you have a winch line that is worthy of the toughest vehicle extractions. 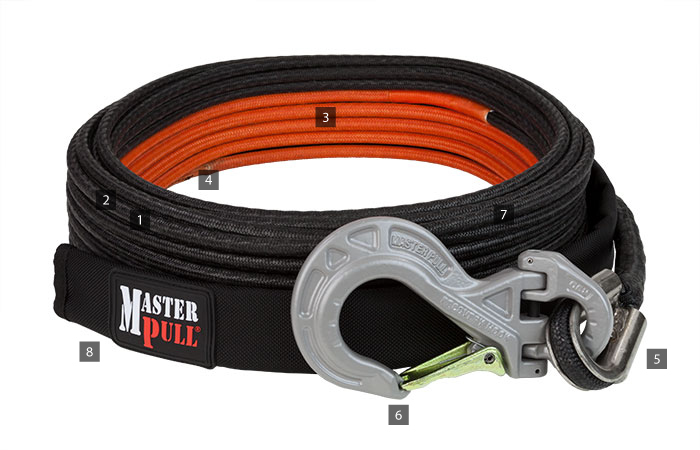 Click the button below to add the 9.6mm (3/8") x 85' Superline XD Black Winch Line - 21,700 lbs to your wish list.